This is the fourth part of our series on the 99 Names of Allah (s) for children. Please see Physicians of the Heart: A Sufi View of the Ninety-Nine Names of Allah for more information about each name in this project if you would like to know more. Present the lesson bellow and discuss one or some of the suggested questions. Fix the medallion to the format you have chosen such as a poster or wall with double-sided tape. This medallion depicts a large wave from the flood of Nuh (a). In the story of Nuh (a) the Sea of Wrath descends to purify the earth. If you would like to read this story to your children please see My Little Lore of Light by Hajjah Aminah Adil. 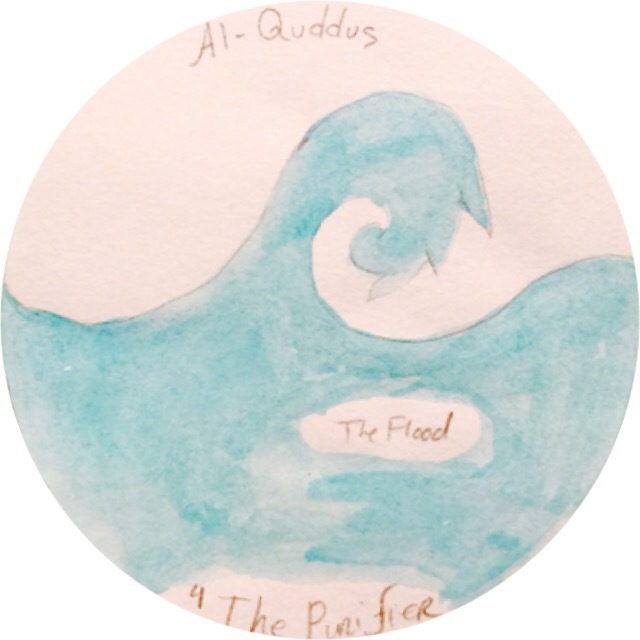 The name Al Quddus means the always purifying. Why did the Sea of Wrath come to earth in the time of Nuh (a)? How do we prepare for our prayers as Muslims? We suggest you choose a space that can accommodate all the 99 Names or to fix the names to a fold out accordion book in sequence if you do not have an appropriate space available. Please share your ideas for teaching the meaning of the 99 Names: A Visual Tasbih to children.